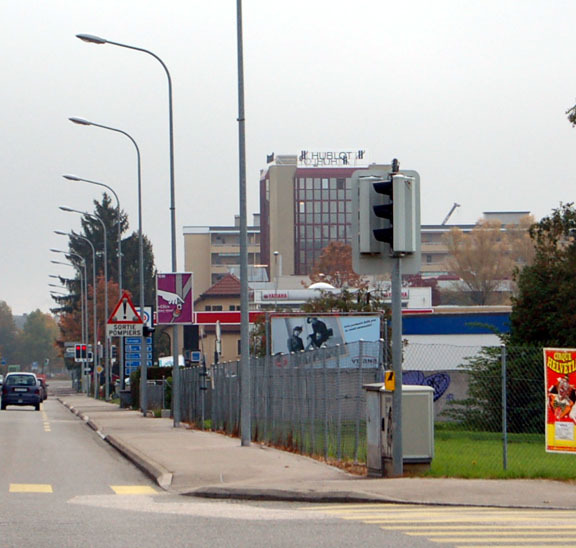 The visit starts on the A1 highway, heading east from Geneva, Switzerland. We travel through the rolling hills, vineyards and lavender fields for about 15 minutes and exit at Nyon, a beautiful old city on the northern shore of Lake Geneva (Lac Leman). In the distance here you can see the Hublot building. 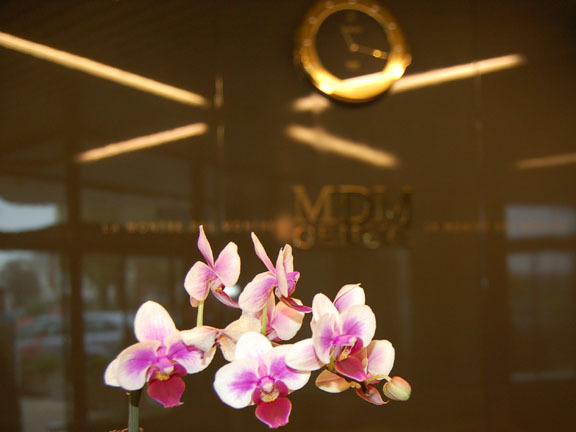 Inside the lobby, we are greeted by a beautiful orchid at the reception desk, with an Hublot clock in the background. 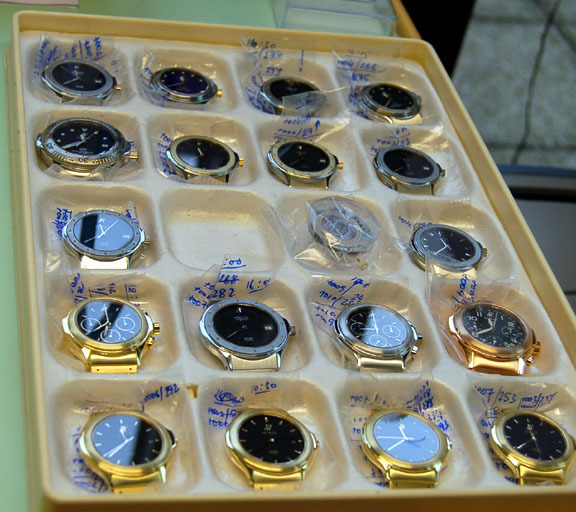 While sitting in the waiting room, I just had to take a picture of a trade show display of watches inside a giant porthole. 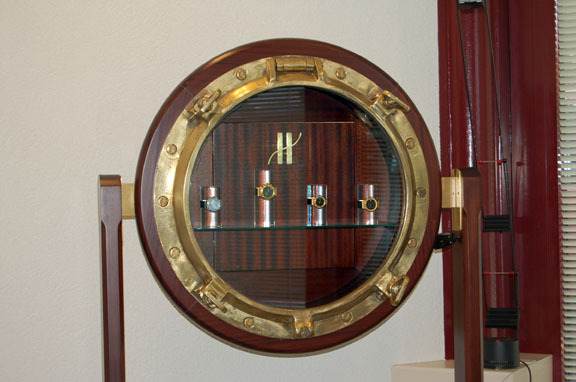 "Hublot" in French means "porthole," the name taken from the distinctive case shape the watches have carried since the company's founding in 1980. In a few minutes, we were greeted by Mr. Alain Prince, Hublot's Head Watchmaker. Heading up to the next floor, we stopped at an antique lapidary bench for this photo. In the workshop is about a dozen watchmakers benches. First is the mounting of the hands onto the movement. 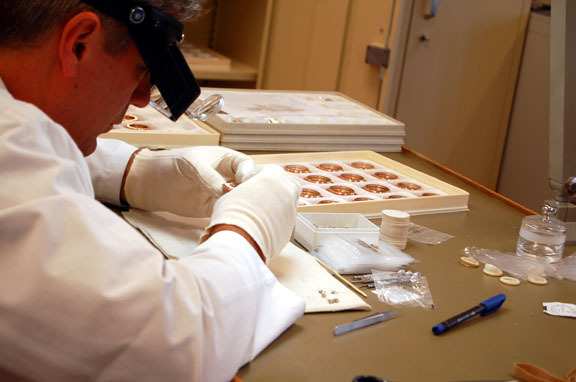 In another area is polishing and then final inspection of the cases. And then the movement is cased. 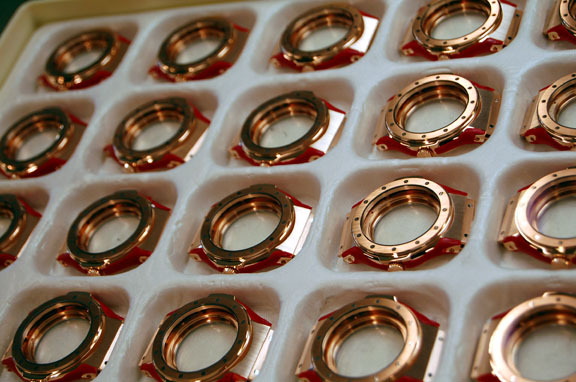 First, the cased movements are put into a ten bay high speed winder for an hour to insure that they are winding and running properly. Then they get a dip one at a time into the pressure tester. 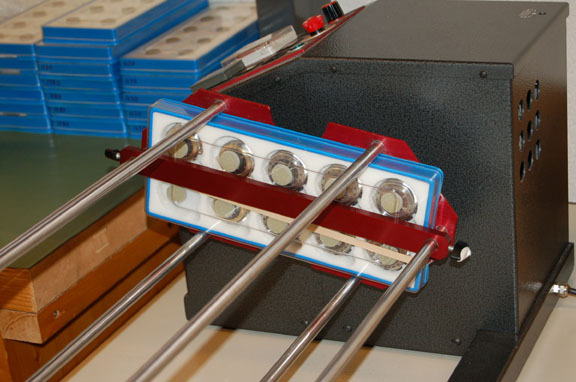 In about two seconds, this machine brings the submerged watch head up to 5ATM. 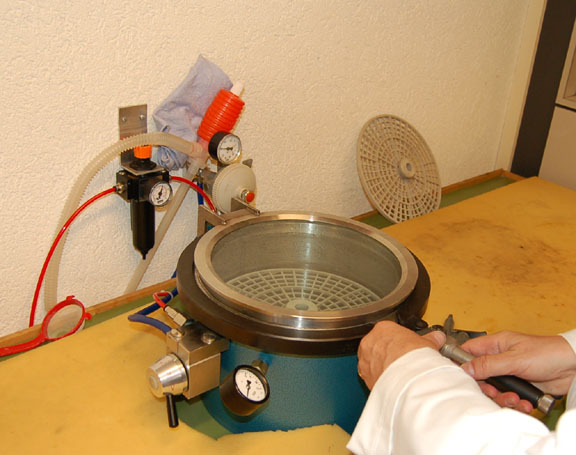 The watch head is then put into a hot water soak, dried off, and a drop of cold water is applied to the outside of the crystal to see if any water will condense on the inside of the crystal. 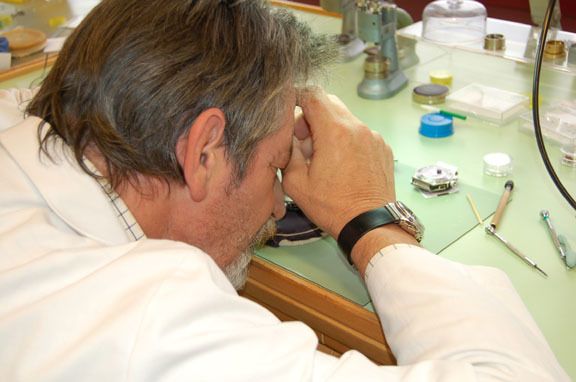 If so, the watch has failed water resistance, and it is disassembled, diagnosed, reassembled and retested. 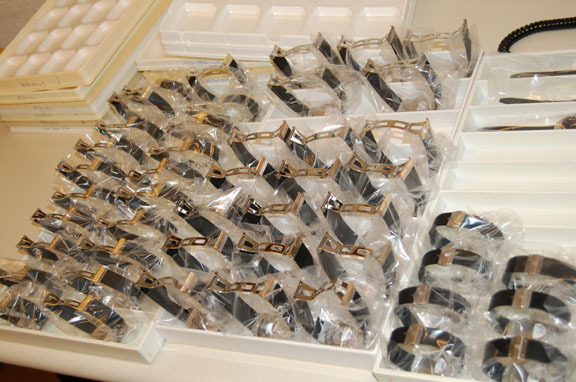 Here are two trays of Big Bang watch heads waiting to be tested. 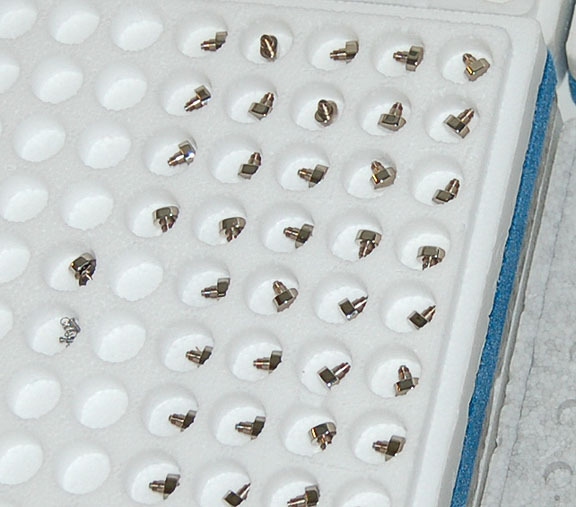 Once the head passes testing and inspection, they are stored in cases like these. Until they are brought to the final inspection area before shipment. 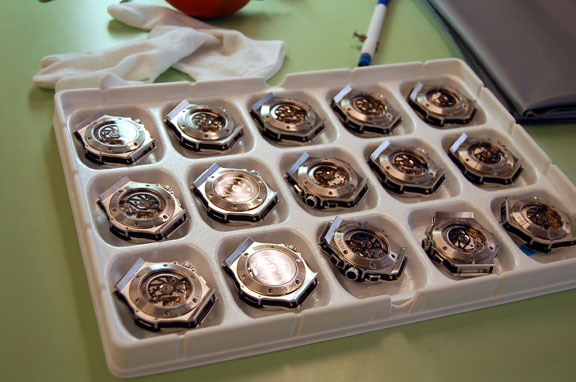 Here, each watch head is bagged. ...and put into the six position timing machine for final regulation. 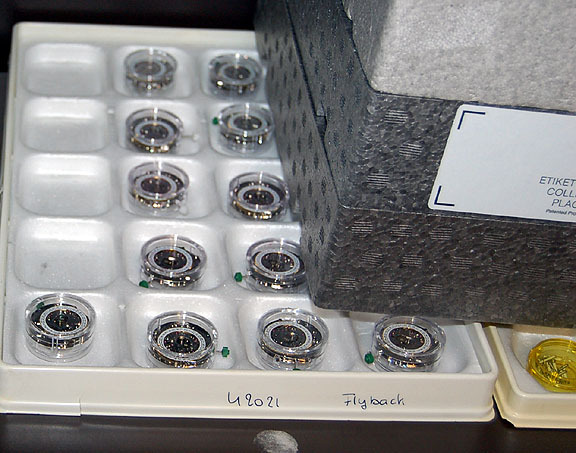 This machine automatically times the watch in the standard positions of crown up, crown left, crown down, crown right, dial up and dial down, and records the results. 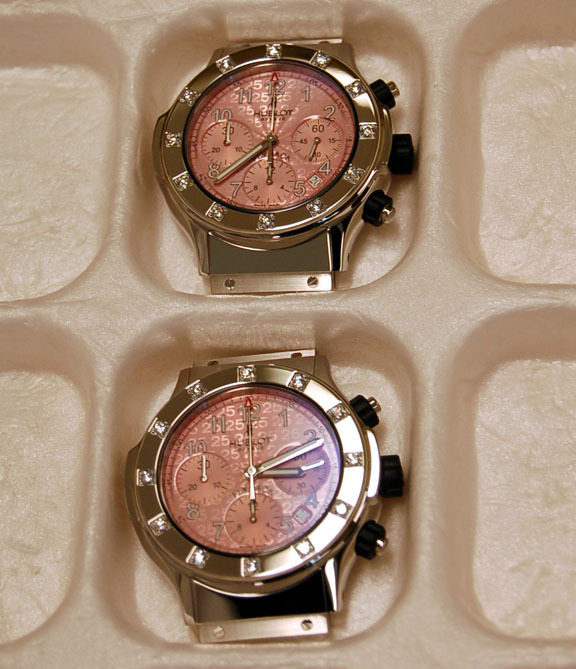 The watch is then run for 24 hours and timed again, the re-regulated before it is approved. 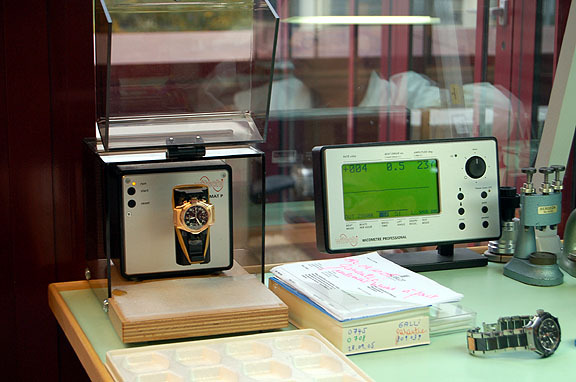 Here is the timing machine, showing the gold watch in crown up position is running at +004 seconds per day. Finally, the straps and buckles are mounted. 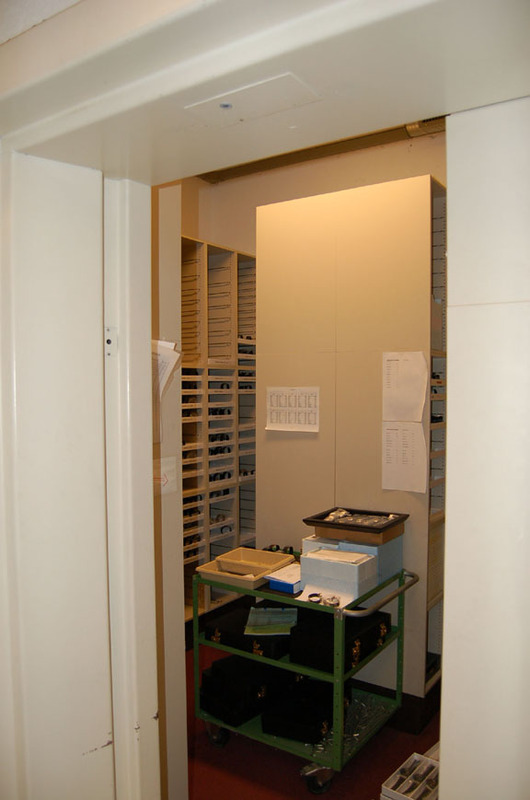 And the finished goods make their way to the vault, awaiting shipment all over the world. 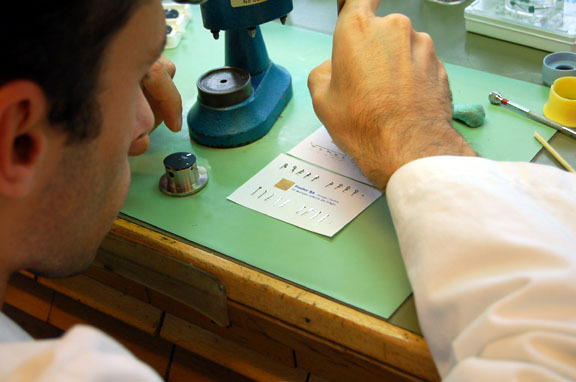 The repair department stocks parts for every Hublot watch ever made, and there is actually a card index for every single watch, detailing manufacture date, where and when the watch was sold, and any repair history. 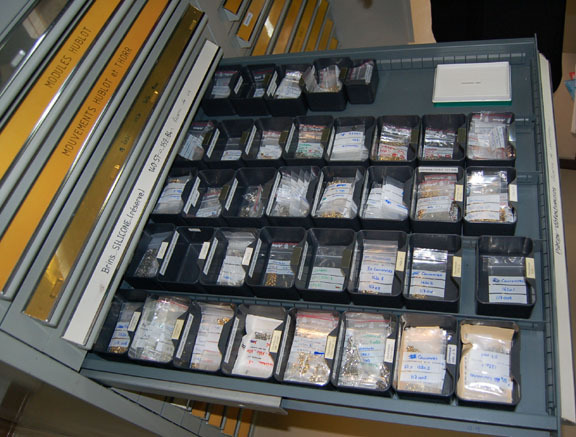 I was amazed at the tremendous inventory of spare parts. 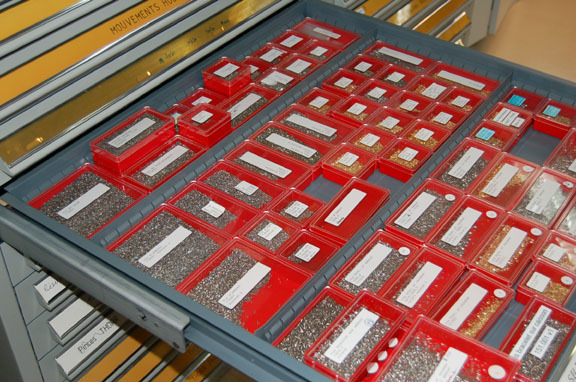 Here is one cabinet drawer with just case assembly screws. And a close up of just one container. 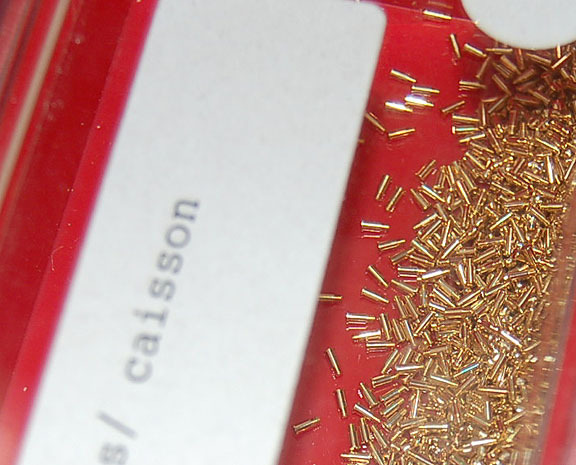 These are the screws that hold the rubber strap into the case end pieces on an 18K yellow gold cased watch. 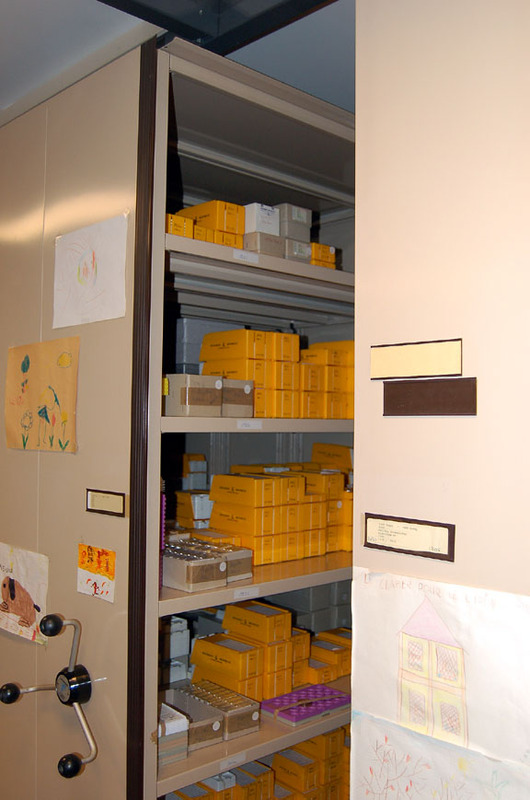 Here is a drawer full of crowns. 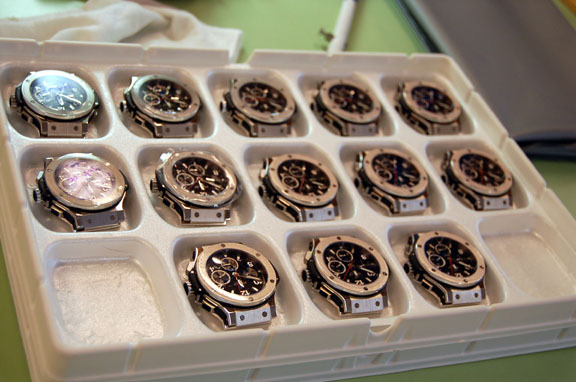 And a tray of chronograph pushers. Finally, after having spent most of the day in the atelier with Mr. Prince, we were brought down into the conference room to meet with the Executive Team. 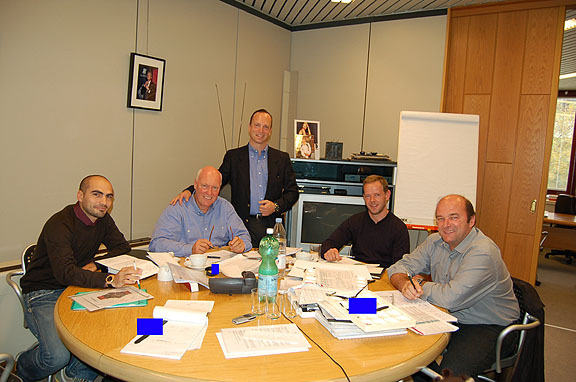 Left to Right is Beniamino Crocco, son of the founder and Marketing Director, Jean-Claude Biver, CEO and Managing Director, myself, Yvan Arpa, General Director and Bernard Gautier, Production Director. What were they doing in the meeting? 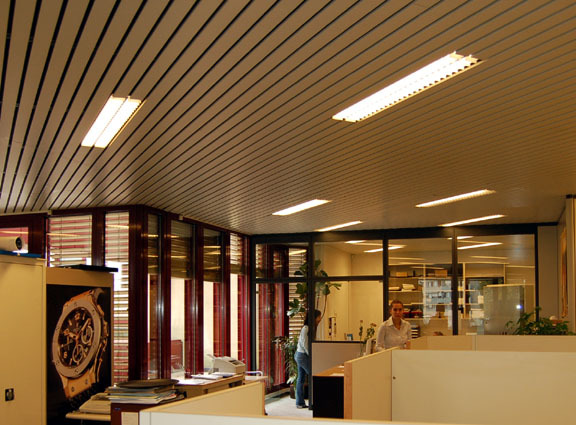 Discussing and inspecting prototypes for Basel 2006, of course! Sorry, yes I did block out the images of the new releases! 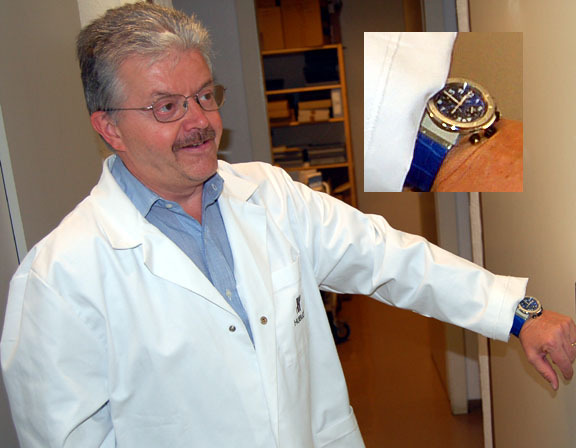 Finally, in keeping with timezone.com tradition, I just had to ask Head Watchmaker Alain Prince, "What watch are you wearing, Mr. Prince?" He very proudly showed me his 25th Anniversary SuperB. 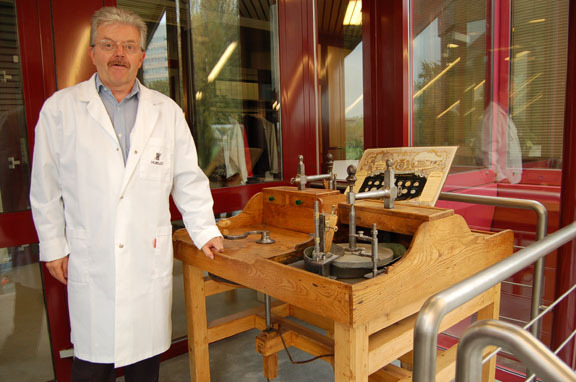 I hope you have enjoyed our tour through the Hublot Atelier as much as I have enjoyed being there. Thank you to Mr. Prince, Mr. Arpa and of course Mr. Biver for inviting timezone.com to come visit the factory.